Amble’s Queen Street boasts more independent shops than any other local small town. A recently-formed team in the town is helping the businesses of Amble with a campaign to encourage locals to shop locally. The ‘Try Amble 1st’ campaign aims to encourage people in Amble to use the services and businesses in the area. The team believes that many locals aren’t aware that what they need can be found in Amble. It is not just the shops — the town has many talented professional service people too. 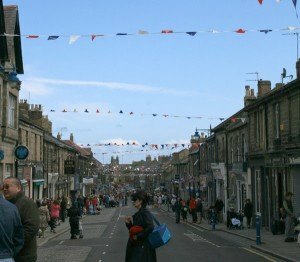 With the support of MP Sir Alan Beith, Amble’s Town Team were awarded £10,000 from the Mary Portas fund, despite being unsuccessful with two initial applications. The Town Team comprises representatives of Amble Business Club, Amble Action Group, Pride in Amble, Amble Town Council and the Development Trust. Members of the Business Club voted for two elements from the original Mary Portas applications and deciding upon the ‘Try Amble 1st’ campaign and running annual events to encourage tourism. Related article: Amble’s First Puffin festival gets go-ahead. One thought on "Support our town’s local businesses"